...a group of like-minded people from around Australia working to reduce the impact of invasive cacti to our primary production and biodiversity. ​It was formed in 2009. 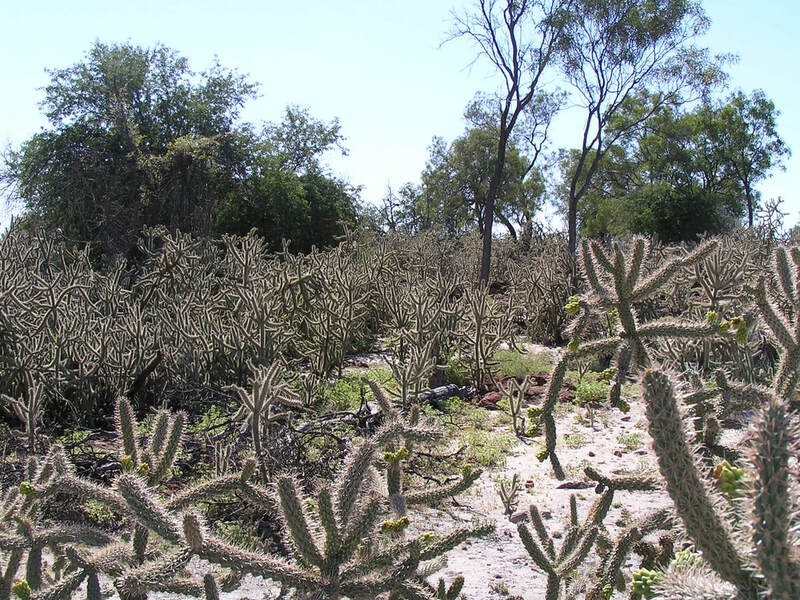 Invasive cacti are a grave threat to our grazing industries. Much of Australia's climate is perfect for them, and there are no natural enemies to hinder their advance. They form dense infestations that hinder livestock access to feed and impedes mustering; their their spiny habit can injure stock, damage fleeces and hides, and affect the safe handling of affected animals for shearing. Invasive cacti are also a threat to our native wildlife The risk of spine injury also applies to native wildlife, either through impalement or the lodgement of spiny segments in limbs, hides and mouths, leading to immobilisation and a painful death. Dense infestations of cacti can impede movement of native wildlife through corridors and limit access to refuges. Competition from opuntioids can also limit the growth of native vegetation, including small shrubs and groundcovers. Introduced cacti are highly invasive plants. Species of the Opuntioideae subfamily have caused problems since the early European settlements days. Some found their way into the natural environment by accident, others have been carelessly discarded. Perhaps the best known prickly invader is Prickly Pear. Acknowledged as one of the greatest biological invasions of modern times, Prickly Pear devastated around 240,000 square kilometres of Queensland and NSW before the introduction of the Cactoblastis moth in 1926. ​​​At least 27 species of opuntioid cacti are now established weeds, having spread considerable distances from the original point of introduction. They pose a threat to much of the arid and semi-arid parts of Australia with major infestations in all mainland states and territories, apart from the ACT.